Add the flour to a bowl and season generously with salt and pepper. Dip the chicken pieces into the egg and coat well with the flour mix. Deep fry in batches until cooked through. In a saucepan, combine the water, orange juice, lemon juice, vinegar and soy sauce. Cook over a medium heat for 3 minutes then add the orange zest, brown sugar, ginger and garlic and bring to a boil. Combine the cornstarch with a small amount of water to dissolve. Slowly add to the sauce until it thickens. 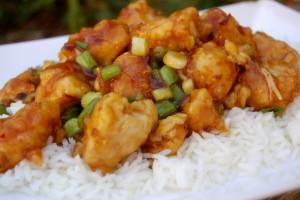 Coat the fried chicken in the orange sauce and sprinkle with the chopped green onions.